Let me guess – you want to start your own blog but the idea of the technical stuff scares you. People around you probably keep telling you to start your own food blog but you’ve been avoiding it for the longest time! Don’t worry – with this tutorial that I’ve created, you’ll have your own blog within the next few minutes and you’ll even learn how to create new posts, and have all the little (free) things necessary to make your blog a success! TODAY IS THE DAY YOU START YOUR OWN BLOG –> And learn how to make a living from it! Hire a web designer to do the work for you. Do it yourself – and save hundreds of dollars from day one! Too many people around the web (and even around you) will tell you that it’s too difficult to start your own blog – but let me tell you something: it is extremely easy! And you need ZERO technical know-how to do it! 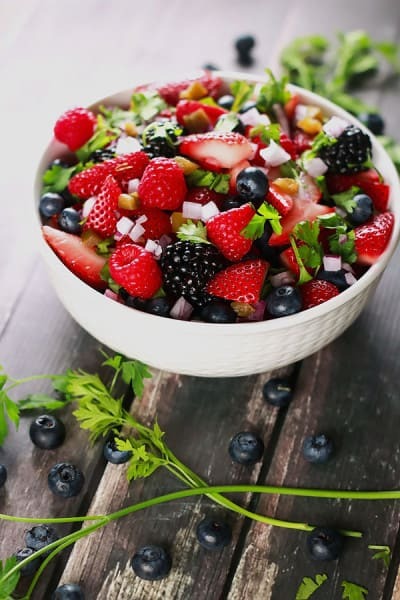 It only takes three steps to create a food blog and that includes making it visually unique! Choosing your domain name and a reliable hosting company. 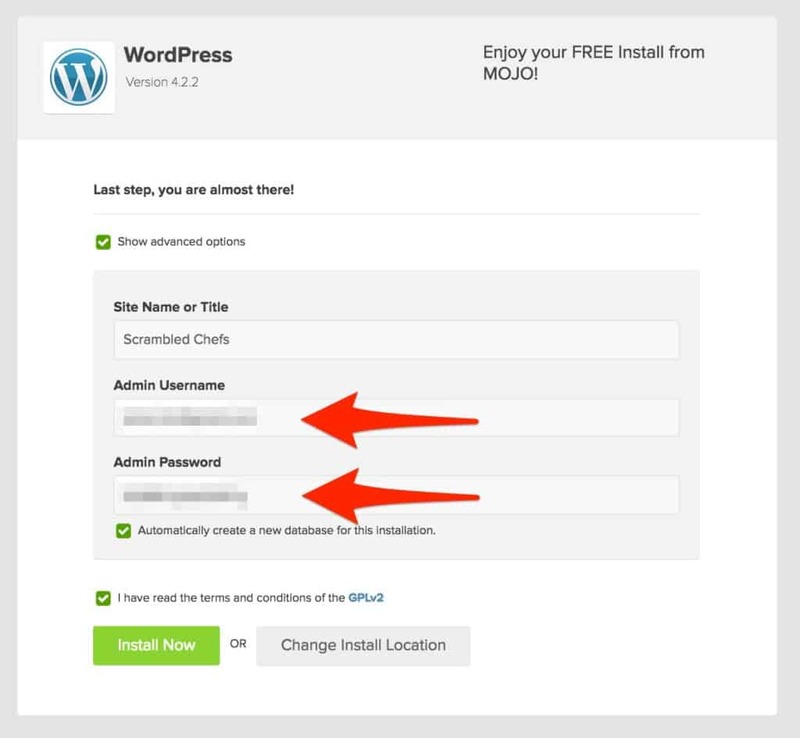 Installing WordPress on your site. Adding a theme to your site and making it pretty! This is by far the most important and crucial step – but that doesn’t mean it’s difficult! You just have to make some decisions and I’ll help you make the right ones! Trust me, it’s super easy! Your domain name is the web address people write into their browsers to visit your site: so our domain name is scrambledchefs.com! Selecting your domain name is crucial because it’s very difficult to change it later, so take out some time and brainstorm all the ideas. You can have your own name in it, or important keywords that describe what the site will be about such as recipes, food, etc! Keep it simple and catchy. Try and go for the .com suffix to keep it memorable. It’s very easy to over think this bit – for me, I always believe that you should go with your first instinct and then discuss it with friends and family before finalizing it! To check the availability of your domain name (since some are already taken!) here’s a handy tool by Bluehost. Pro Tip: I also recommend checking your domain name on namecheckr.com, to know whether or you’ll later get all the social media accounts under that name. By just adding your domain name/brand name on the site (e.g. for us it’s scrambledchefs) it quickly tells you whether that username is available across all important social media websites e.g. Facebook, Pinterest, YouTube etc! Act Fast: Once you’ve found the right domain name for your blog, go ahead and register it right away! You can do this via GoDaddy which will cost you $15 per year OR you can get it for free when you register with Bluehost for your hosting company! I say act fast because I want you to learn from my mistake: in the past I’ve wanted to register a domain name but I didn’t do it right away and I waited for a few days. By that time someone else had already registered the domain name for themselves! So please, once you’ve spent your time and energy selecting one, grab it right away! This is part two of step one and is the last most important decision you need to take! You have to choose which hosting company to use for your blog. Let me explain what a hosting company is: a hosting company allows you to rent a space on the internet so your site is viewable to everyone around the world. This is what can make or break a blog. A bad hosting company can create a lot of problems for your site down the lane – frequent instances of site being down resulting in revenue loss, malware and security attacks are just two of the many issues you can face. So choosing a reliable hosting service is crucial! I know way too many bloggers who have made this mistake in the beginning and have faced many issues later. I absolutely trust and recommend Bluehost. For starters, they are by far one of the most popular hosting services for food blogs, and blogs in general around the world. They provide EXCELLENT 24/7 customer service and you can register you domain for FREE if you select them as a host – that’s $15 you saved instantly! PLUS they have a 1-step WordPress Installation built in (more on this later)! They have a great refund policy as well – so if in case you decide in a few months that Bluehost is not the right choice for you, they’ll issue a FULL refund to you for any months left in your account. Many hosting companies don’t honor this promise, but I know for a fact that Bluehost does. Their 24/7 customer service is fantastic, plus they’re super friendly and will keep helping you till your problem is 100% solved. Like other hosting companies, you pay upfront which is exactly what you want to do so you don’t lose out on your domain name in the future! We’ve paid for Scrambled Chefs for the next 5 years which I intend to extend to 10 years atleast! Ready to sign up and start your blog? Let’s begin! 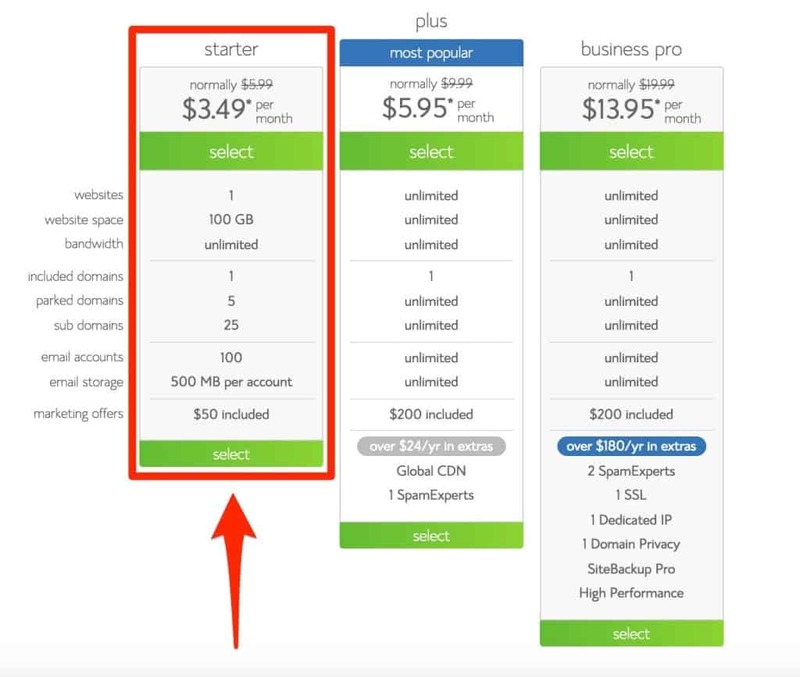 Select your hosting plan. We recommend you select the starter plan – it’s $3.49 per month that you’ll pay lump sum but will save you quite a bit of cash! This $3.49/month is an offer that I’ve bargained with Bluehost for my readers only – you only get this price through this link. Do your homework. This deal is only available here and they’ve passed this special price to me for a limited time only. Grab is soon before it’s gone! This offer is only valid till 31st May, 2016! Here’s a screenshot of the package details I’ve selected for my blog! 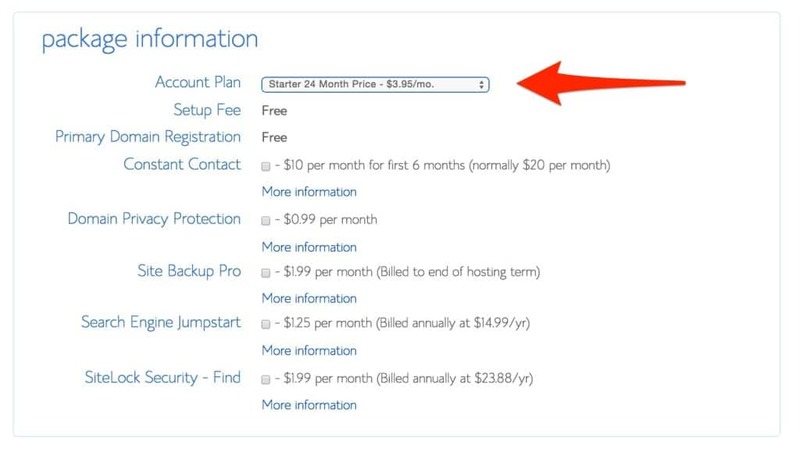 I don’t bother with the rest of the packages – they can be easily added later though via your Bluehost panel if you need any of them in the future! You now have a blog!! Now the next step will help you make it EXTREMELY easy to write new posts, add images and make your blog prettier! Now that you’ve gotten your domain name and hosting, the next step is to install WordPress. WordPress is the most popular blogging software that bloggers all around the world use daily. PLUS it’s FREE!! It’s also extremely easy to use and requires virtually no technical know-how to do even the most complex tasks! Since you’ve signed up with Bluehost, installing WordPress on your site is just a one-step process (unlike with other hosting companies!). Log into your Bluehost account and scroll down to the website section (see the screenshot below) and click Install WordPress. 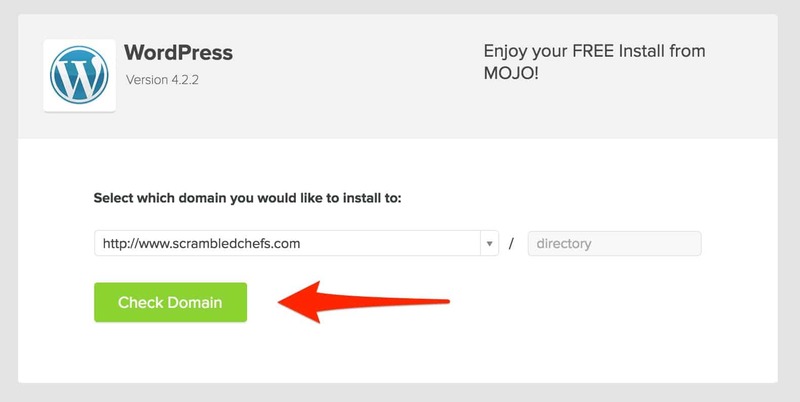 On the next page, click the Install button in the Do it yourself (FREE) section as in the screenshot below! On the next page, click on Check Domain (see the screenshot below). In the next window, click on the ‘Show advanced options’ checkbox (see the screenshot below). YAY!! YOU’VE INSTALLED WORDPRESS ON YOUR SITE! 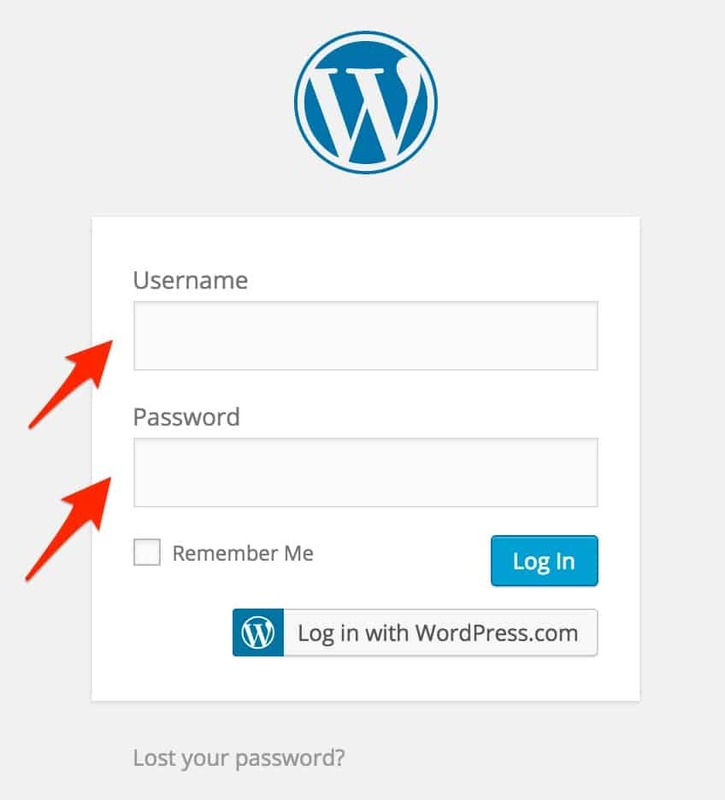 Once you go to your Admin URL, you can add your username and password (as in the screenshot below) and you’ve then officially LOGGED INTO YOUR OWN BLOG!! Congratulationss!! You’re all done and you now officially have your own blog!! Now let’s make it pretty and exactly how you want it to look! STEP THREE: SELECTING A THEME AND MAKING YOUR SITE PRETTY! Now comes the super fun part! Your blog’s theme is what decides the look and feel of your blog. You can select from a ton of free themes that WordPress offers by browsing through this link or you can select a premium theme. I have the Divine Theme from Restored316 on my blog and have customized it a bit to make it even more unique – which brings me to the advantages of having a premium theme. You can do A LOT MORE with a premium theme than with a free one. You can also easily customize it and the support system is usually fantastic (especially for Restored316!). Premium themes come at a price – and for a good reason. You get several advantages right off the bat because of these kind of themes. Most premium themes provide excellent customer support and you can quickly contact the creator of the theme if you run into any issues. Plus they’re usually responsive which means your site will look great even on tablets and mobiles (and that’s super important!). You can also do a lot more with a premium theme than a free one. Studio Press Themes: These themes are one of the most trusted by web designers and bloggers around the world! They’re responsive, SEO optimized and absolutely beautiful. They include detailed how-to videos and instructions so you can make the most out of your site. Plus you’ll find loads of resources all over the internet for their themes. Foodie Pro Theme: The Foodie Pro theme is stunning and made just for food bloggers. It’s also a Studio Press theme and I highly recommend you check it out. Restored316 Themes: I absolutely love Restored316 themes – they’re made for women, and made by women. They have excellent customer service and are always quick to reply to any queries. If you have any questions, leave them in the comments down below and I’ll reply within 24 hours!